'Ring of Fire 2013' - Annular Solar Eclipse - The Sun Today with C. Alex Young, Ph.D.
Queensland Australia gets another celestial treat after enjoying a total solar eclipse in November 2012. On Friday morning, May 10 (local time Australia), the Moon will travel in front of the Sun blocking most of its light—except for what looks like a ‘Ring of Fire’ around the Moon’s edge. 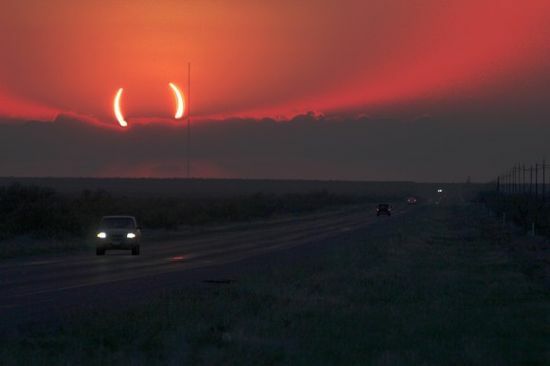 Below is an image of the annular eclipse from May 2012, the first annular eclipse visible from the contiguous United States in around 18 years. The ccsc.org broadcast begins Thursday, May 9, at 5 pm EDT while the space.com and slooh broadcasts start at 5:30 ap EDT. The annular eclipse of May 10, 2013 is the first eclipse of 2013. 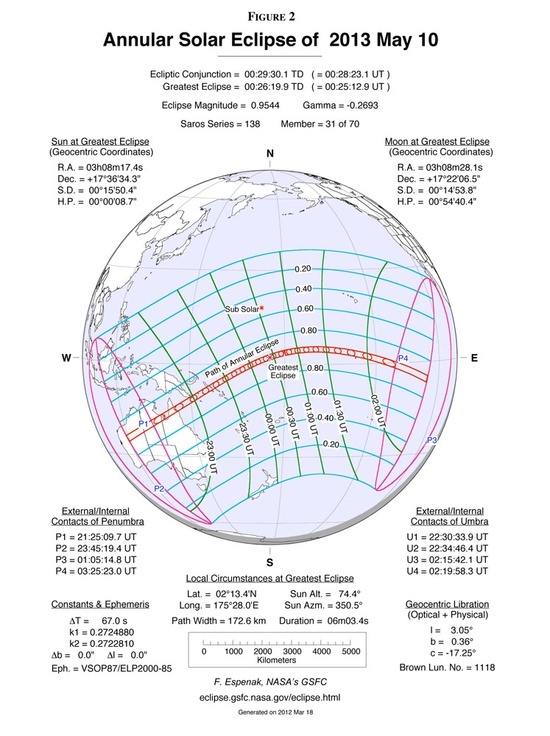 The eclipse will be visible from a 171 to 225 kilometer-wide track that traverses Australia, eastern Papua New Guinea, the Solomon Islands, and the Gilbert Islands. The annular path begins in Western Australia near Collier Range National Park at 22:33 UT and end at 02:20 over the Pacific Ocean. Science at NASA created a video last year in preparation for the May 20, 2012 annular eclipse over the United States. Below is a figure of the eclipse predictions from Fred Espenak of NASA GSFC.